Beer. Birra. Bier. - A blog about beer and brewing. : Cave Creek Chili Beer - Terrible! That conversation about the best beer in the World is one you often overhear or take part in, but how about the worst beer in the World? Eddie Gadd has a nice philosophy when it comes to beer he doesn’t brew. I once heard him suggest that life’s too short to worry about the parts of a beer that aren’t perfect. If it’s drinkable, and you’re drinking it, focus on the parts you like and enjoy yourself! I like this as a mantra to drink by but it’s somewhat inevitable that, as enthusiasm for beer grows in a person, so will their predisposition towards cynicism and pedantry. It’s good to be reminded from time to time that it is ONLY beer, if it’s served a bit warm or if it’s a touch too sweet, it’s not the end of the World. Sometimes though, no amount of optimism or positivity is enough to overcome the fact that something really is just down right terrible. Enter Cave Creek Chili Beer, a beverage so awful that it took no effort to see the glass half full … in fact the glass looked like it was only missing two sips! 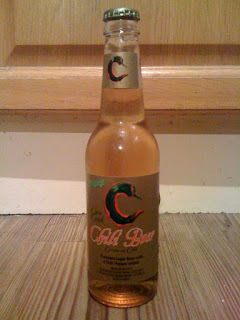 If you haven’t encountered chilli flavoured beer before, it isn’t as unusual as you might think. Stu at the Crown Brewery in Sheffield makes a stout with chilli* that’s very highly regarded. Similarly, Stuart Howe at Sharp's also produced a Chilli Double IPA as part of his fifty two beers project which, again, was well received by those that tried it. Cave Creek Chilli Beer is a Lager brewed in Mexico with chillies; it’s then bottled with a whole green chilli to further allow the beer to become infused with chilli flavour. Smell this beer and watch as optimism drains from your face. The aroma is a sickly combination of sweet corn and chilli fruit, the result being something akin to chilli jam on the turn. The taste is as bad, if not worse. 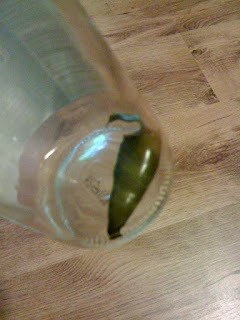 It starts slightly sweet before a massive hit of chilli flavour smashes its way through. Too much chilli, so much that you can’t taste the underlying beer. Swallow if you dare, in comes a crazy amount of heat; it’s like rubbing the inside of a cut chilli all over the back of your throat and waiting to see what happens. It’s a dry, burning heat that just builds and builds. Now, by way of a slight disclaimer, I feel it necessary to state that I quite like spicy food and chilli heat. I need to be in the mood for it but I’ll happily plump for “extra hot” at Nando’s and one of my favourite things to eat is a Cheese and Pickle roll with Jalapenos. I might not be a Lamb Phall man but I can certainly handle something a bit spicy. This beer is hot! Some mild cheddar in the fridge, I thought the beer might work better alongside something else. The problem being that the ruinous effect of the heat on your palate means it’s difficult to taste anything after a few sips … the beer included! I can’t understand how anybody could like this beer, nor can I understand how anybody could manage to drink more than a few mouthfuls of it. The worst beer in the world - who knows? One of the least enjoyable beers I’ve ever consumed - without doubt! Sorry Eddie, I did try. * Thanks to Mark from Pencil & Spoon for pointing out that Ring of Fire [the Crown Brewery beer] actually started out as a Barley Wine and has since moved into Strong Ale territory. It's not a stout. Yep, this beer is horrific. One of my mates like his curry HOT (a phal guy) and on his birthday we went out on a big night and bought him a bottle of this which he strawpedoed! His night literally ended there and he was a mess for the rest of the evening!! It's not even drinkable and there's nothing redeeming about it. I do wonder, however, if it would make a decent ingredient in a beer curry?! FYI: Ring of Fire isn't a stout. The original was like a barley wine, the new one is more DIPA, strong ale (not sure which, it's a boundary-crosser, but definitely not a stout). Nice idea about using it as a curry ingredient. Not sure it would anything more than just normal chilli though. Strawpedo-ing one of these sounds like the act of a mad man. You'd need asbestos tonsils to survive something like that. Thanks for the FYI. I meant to look that up to make sure but got distracted (blogging from work - not the best idea). One of my local pubs had a beer on which included the use of chilli's in the brewing process. The tasting notes on the blackboard failed to mention this, and it turned out one patron was alergic to the spicy buggers and an amubulance had to be called. As it departed (the guy turned out to be fine) the landlord's parting shot was 'at least your not allergic to bloody hops. Then you'd be in trouble'. No word of a lie. Wow, I'm not sure what's worse. The total lack of concern for the bloke with the allergy or the fact that the pub could sell a beer with such a specific ingredient and not think it worthwhile to mention it. Shocking.